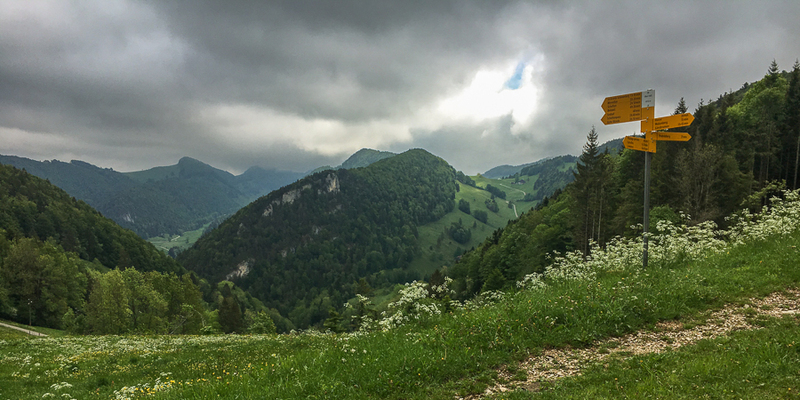 The weather forecast wasn't what you'd hope, so we opted for a hike through the Jura instead of something more adventurous. 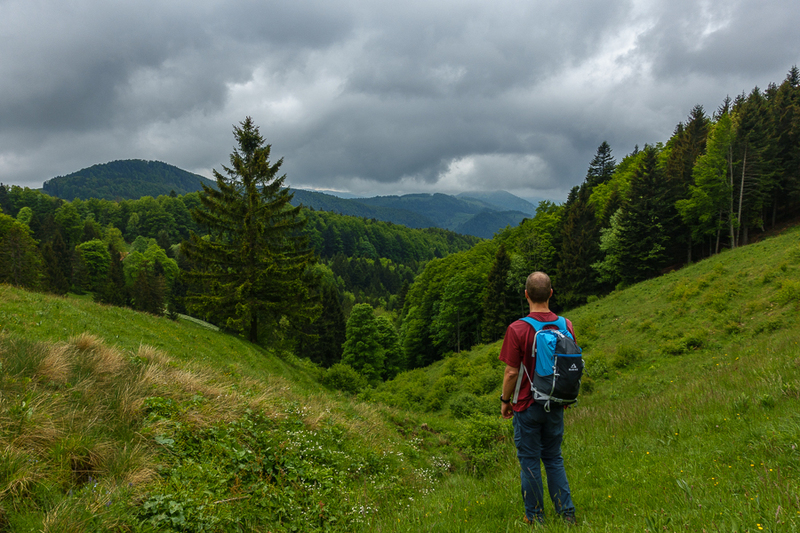 This was something of a play-it-by-ear hike through a section of the Jura where we hadn't been before. We start at the train station in Corcelles and then follow the road up the valley for a bit before moving off onto trail. This is through quite wet grass, so moving off the road is something of a mixed blessing and leads to wet legs and shoes... ah well. Up the valley go, through our first herd of cows of the year, over the fence (electrified, as g discovers... ouch!) and back onto the road when we get close, past the Alp at Paturage derriere, and then onto a forest road that climbs gently up the side of the valley. This is a really nice bit through the woods. At Mittleri Hell we switch back to a trail through the grass and climb up, up, up to the saddle at Oberi Hell with its nice view forward. Instead of heading down through the wet grass, we follow the road around the bend and head down, down, through the gorge, past Seehof, and up to the farmhouse (including a fish farm) at Stäge. Up through a narrow bit of gorge, past the hut at Hüsligrabe, and then up, up, on a lovely trail through the woods. We do a lunch break in a nice clearing and then head up, up, out of the woods, up, up, to a pass and then down to the farm at Rotloch. Note: you can see Basel from this pass, which is pretty cool. Now we gently climb to the ridge and hit the Matzendörfer Stierenberg. Last time we came by here we had a nice lunch, but today there were no tables free inside and it was a bit too chilly and windy to eat outside... ah well. Onward we go, descending to the Scheltenpass, and then along a nice bit of very typical Jura ridge hiking (yay!) until we get to Vorder Erzberg. This is open, unlike last time, and with a couple free seats, but we decide that the dining room is too loud and hot and continue on. From here the first couple of km are well known from previous trips, but instead of turning down towards Neuhüsli we continue along a very, very nice path that contours under the trees along the face of the Sunnenberg. We climb a bit after emerging from the trees, have a nice second lunch break with a view just past p968, and then continue along the road and down to the bus stop at Passwang tunnel.